This site averages well over 170,000 page views from over 28,000 unique visitors a month! 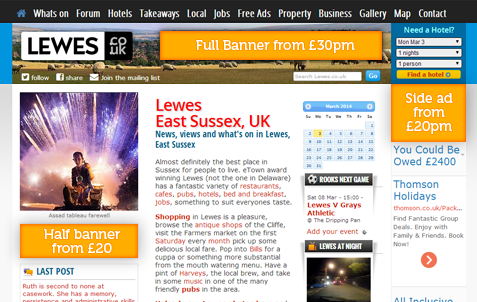 Any way you look at it for a town the size of Lewes that's a lot of exposure for your business! There are currently standard ad positions 3 areas available as shown below. These can be booked exclusively per page or as part of a shared space with a maximum of two other ads randomly rotating. As some pages attract more traffic than others they provide more valuable space and are priced accordingly. The 3 premium pages are, the Home page, The Lewes Forum pages and the Whats On section.